This healthy dip is easy to make and taste great with crudites such as cucumbers, peppers, zucchini and celery. You can substitute jarred roasted peppers if you wish but freshly roasted peppers are best. Chick peas are high in dietary fiber, protein, folate and zinc. Serve with fresh vegetables like cucumbers, peppers, celery, or whatever you desire. I made it just as listed and it was delicious. Very happy to find a low point (WW) dip that is so good and easy. This was amazing! I used chipotles in Adobe sauce cause that’s what i had on hand and it turned out perfect! This looks delicious!! Just wondering for points purposes, It says serves 4, so is that about 1/2 c. per serving? I didn't love this 🙁 I do love chickpeas and roasted red peppers, I think it was a little heavy on the parley and garlic. But I love love love almost everything else I make from your site and its the first place I look when I want to plan dinner! I made this tonight with a few tweeks due to lack of ingredients and a general laziness (didn't want to go to the grocery store). It was very good! 2 cans garbanzo beans, 1/2 jar roasted red peppers, olive oil, salt, pepper, garlic. YUMMY! points plus is 5 per serving. Do you have the updated points plus value (looks like old WW points here) and additional nutrition facts for this one? Thanks! How long do you think this will stay in the fridge in an air-tight container? I'm interested in knowing this as well. I am doing WW Points Plus from home and I do not have access to the recipe builder just yet. Made with jalapeno today, tasty! I just made it, it is very good, but I would use less sesame oil and more roasted red peppers. I make something similar from Cooking Light – it uses Cannellini beans instead of chick peas and a few other swaps. It's a little bit lighter in taste. Did everyone else leave the sesame oil out? We followed the recipe exactly and all that we could taste was straight sesame oil. 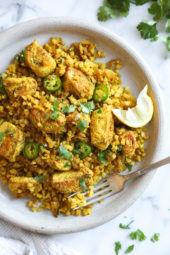 This is one of my favorite recipes 🙂 I make it twice a month! I love your site – thanks Gina! This is absolutely delicious! My new favorite way to eat carrots! 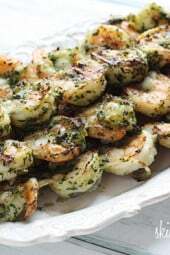 This is lovely – I will add a little less lemon juice and may use roasted garlic next time as it was a little "raw" but still lovely! No not a must, I love the flavor of sesame and thought it would make a great replacement for tahini. Try without and thanks for sharing your recipe. 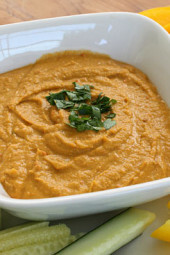 I have an old ww chick pea spread recipe that is excellent that only uses 2 tsp olive oil. 12oz. chick peas, 1/2 c plain non-fat yogurt, 2 T fresh lemon juice, 3 garlic cloves, 2 tsp olive oil, 1/2 tsp salt, 1/2 tsp cumin, 1/8 tsp allspice. It's all blended together, thinned with a little water if necessary. What do you think if I just added the parsley and roasted pepper? Do you think the sesame oil is a must? I do love the flavor of sesame oil. This is still the old, sorry hopefully I'll get to this one soon. Are the 4 points- the old points or the ww + points? Hi Gwen, yes I blended it all together. A little more on top was just for garnish. do you add the parsley into the blended dip or just on the top? Says to blend all together but your picture doesn't look like there are specks of green in the dip so I figured I'd check first! 🙂 Thanks! @Marin- Either would work fine as long as it's pure sesame oil. Do you use toasted sesame oil or just regular cold-pressed sesame oil? I'm guessing about 4 oz but when you make this, weight the whole thing and divide it by 4. Sorry, my older recipes didn't include serving sizes. I just divided all my recipes by servings. If you make this let me know what it comes out to. Thanks! Chick pea is very good for health.And it is also used as a staple in the diet in India…this is an innovative idea. This sounds perfect for a summer meal served on the back porch. Gina! Your site is A-MA-ZING! So glad I stumbled onto it. The recipes and pictures look so awesome…can’t wait to start trying them! Thank you thank you thank you! Wow, you introduced me again to a new great sauce/dip with so many healthy values like fiber, protein, fosfate and zinc. My hubby just joined WW and it looks like I just hit the jackpot for recipes. Wow! You make really simple and delicious recipes! Great blog my dear! as always looks yummy, thank you Gina! 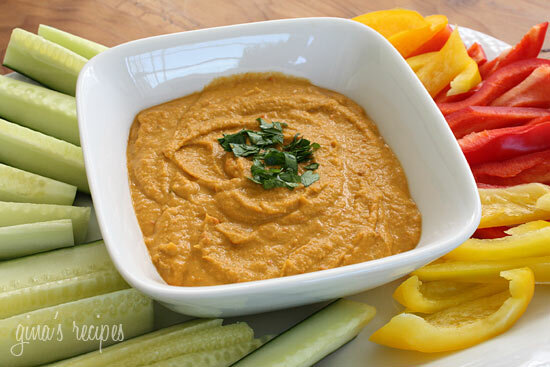 I was just thinking I should try to make a roasted pepper hummus – looks delicious! 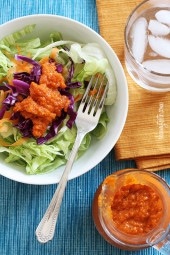 Love it- easy and healthY!